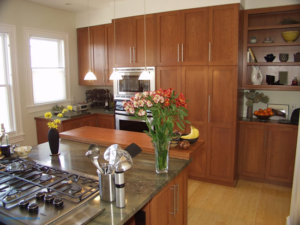 Lightly spray wood-laminate cabinets with a nonabrasive all-purpose cleaner. Leave it on for several seconds (watch for drips), then sponge off. To save yourself work, use lids on your pans or get a round metal splatter cover to put over the skillet.